The “passive” cross breeze becomes an “active” breeze for QuietCool homeowners, and this is the key to thermal mass cooling. Passive breezes within a home will eventually cool the ambient air to a comfortable level, but will not move enough air to cool the mass within the home. Mass “cooling” results because the QuietCool system is removing stale hot air and replacing it with fresh cool air; all this occurring at a high rate of speed and volume, 15-20 times per hour. Therefore, instead of recycling hot, stale ambient air through a closed-loop air conditioning system, the QuietCool system is exchanging hot, stale ambient air with fresh, cool outside air, through an open-loop whole house ventilation system… and at a fraction of the cost of running an air conditioner. This is for insulated homes that are closed during the day. A “cool mass” home does not reheat as much or as quickly as a “hot mass” home. Within a day or two of installing a QuietCool system, homeowners are amazed when they come home after work… it was 90 – 100 ++ degrees outside, and they walk into a home that is… not 90 degrees, but maybe 72, 74 or 76 degrees. The reason is because the mass of the home has been cooled by the QuietCool system, and thus did not reheat as rapidly throughout the day as a typical home would. The initial reaction from new QuietCool owners is one of amazement and is the reason why so many QuietCool sales are made through referrals. QuietCool is truly a revolutionary product that allows people to save money by turning their A/C off and turning their QuietCool system on! 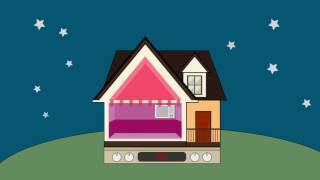 What is the difference between whole house cooling and air conditioning? Whole house fan cooling draws hot trapped air out of the home while bringing fresh cooler air inside. Air conditioning uses a compressor to remove humidity and chill air.–A much more energy intensive process. Many folks find that extending the hours of natural cooling and limiting the hours the air conditioner is run, not only saves energy, but also increases the comfort of the home. 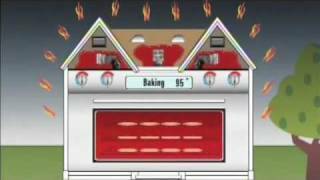 Can I use both an air conditioner and a whole house fan? YES, definitely, but not at the same time. In Hawaii, the whole house fan is most often used when the outside air temperature is 86 degrees or below. The air conditioner can then be saved for when temperatures are above 86 degrees or on days of high humidity. In homes without A/C, or where natural air is preferred, the whole house fans can provide year round cooling, but are less effective in temperatures over 86 degrees, or on days with high humidity. How can a Whole House Fan cool your house when the temp outside is 84? With a whole house fan properly sized for your home, it will be able to exchange the air volume of your home every 3-10 minutes. This rate of air movement gives you a cooling effect of 4-6 degrees, so your home can feel as if it is 78-80 degrees. How do you calculate the ideal rate of exchange in CFM? The square area of your home in feet is multiplied by the height of your ceiling for the volume of the home in cubic feet. The CFM output of the fans are listed on the Products page. Divide the volume in cubic feet by the industry air exchange standard of 3 and you will get the targeted CFM. For example, a 1,200 square foot home with 8 foot ceilings will have a volume of 9,600 cubic feet. Divide 9,600 by 3 minute target air exchange and you have an ideal air exchange rate of 3,200 CFM. Does a Whole House Fan have to be centered in your home to work effectively? No, but it does matter where your open windows are located. Air, like water, flows in the path of least resistance. The bigger the window and the closer to the fan, the less resistance that location provides. This can mean opening windows strategically to channel air to specific areas of the home that you want to cool. Please note that jalousie windows cannot usually be sealed completely and even when closed may affect the path your air takes to the fan. In zones where there is no circulation, additional fans can be used to target those specific areas. How do I get the Breeze Effect from my Fan? A Whole House Fan is very effective in moving a large quantity of air. The QC4500, for example moves 4500 CFM. If 4,500 cubic feet of air per minute is moved through only one window you will feel a very consistent breeze. To decrease the strength of the breeze simply open another window. Now the 4,500 CFM is divided between two windows at 2,250 CFM per window, 4 windows would change the air flow per window to 1,100 CFM. (A room fan moves about 1,400 CFM) Opening more windows doesn’t decrease the overall airflow, but decreases the airflow per opening for less breeze per window. To increase the Breeze Effect, target the area of the house by closing some windows. Please note that jalousie windows cannot usually be sealed completely and even when closed may affect the path your air takes to the fan. Can I put a Whole House Fan anywhere I want? The placement of the whole house fan depends on how your house is built. Traditional belt-driven fans usually required 5 feet of attic clearance, while ducted QuietCool fans can be installed in as little as 24 inches of clearance. An inspection is helpful to determine where it should be placed. A whole house fan can only pull in as much air as it can push out of your attic. The 2009 IECC (Hawaii Energy Code), the FHA and many roofing companies recommend 1 foot of attic ventilation for every 300 square feet of attic space. This means that a 1200 square foot single-story home should have four feet of attic ventilation. As part of the inspection process, we will check to make sure that you have adequate ventilation and make recommendation for correction if venting is insufficient. Past fans had a reputation for being noisy. Using insulated ducts, and optimized motors, QuietCool whole house fans are the quietest systems available with sound levels that vary from 43dB (decibels) to 57dB depending on the size of the system. For comparison, this is similar to a normal oscillating fan on low or high. While these sound levels are considered very quiet, not all systems are appropriate for installation in all areas. (You wouldn’t want to put a larger unit in a bedroom). 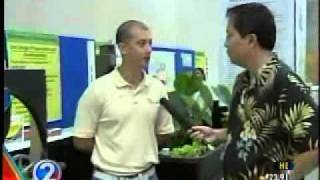 Also, since many Hawaii homes lack insulation, it’s important to talk with a consultant who can help you to determine the correct system and location for your home. I love it (Stealth4.8) and use my system every day. If it’s a humid night, I’ll run it then as well. It was a real lifesaver during the heat of last summer; it cooled off the house without having to spend any more on electricity. While others were complaining of higher bills we didn’t see that. I don’t know what we would have done without it. We had a our Whole House Fans installed a few years ago. We had fans installed in the bedrooms and living area. We love the ease and comfort that the fans provides us since we got them. It works to cool down the house. 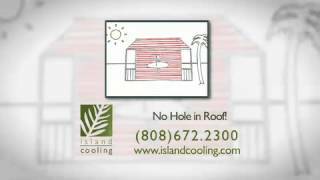 Island Cooling has excellent service during installation and afterwards. Your response time in contacting us back about repair matter and coming out that day is truly appreciated. We tell everyone about the fans it’s also great for our house dogs to help keep them cool. A great investment for our house. 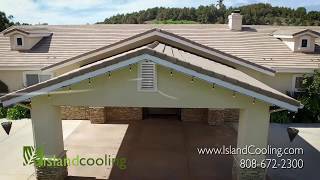 We live in Mililani Mauka, so we are fortunate to have cooler temps…adding Island Cooling fans to our house has decreased the use of our AC units and has lowered our electric bill tremendously!! Our upstairs bedrooms are no longer saunas for the entire evening. The systems are easy to use (even the keiki know to come home crack open the windows and turn on the fans), efficient and quick results! Instant relief in our house!! I installed a solar powered attic fan and that helped a little, but attic fans do nothing for the air that’s in your house. Enter the whole house fan, the QuietCool is a true refinement of the whole house fan, and it’s made a huge difference in the comfort of my home. All-in-all very “cool” product that I highly recommend. My home doesn’t have any natural breeze. We open the back door of the home to channel the air up to the fan. I used to run my A/C 12-18 hours a day. I now go months without running it. People have to see it to believe it, but it’s the best money I’ve spent”. We are so proud of having purchased such a highly efficient system!!! The problem is … WE JUST HAVE NOT BEEN ABLE TO TRY OUT THE NEW A/C. Not even during the dry spell week before last!!! Your fan works too well!!! It works so well I’m wondering why I bought a new A/C?? What can I say?? THANK YOU! The U.S. Department of Energy’s Alternative Fuels Data Center (AFDC) provides information, data and tools to help fleets and other transportation decision-makers find ways to reduce petroleum consumption through the use of alternative and renewable fuels, advanced vehicles, and other fuel-saving measures. The U.S. Department of Energy’s Green Power Network provides news and information on green power markets and activities, including opportunities to buy green power. This site provides state-by-state information on green power marketing and utility green power programs. In addition, the site lists marketers of renewable energy credits (RECs), also known as green tags or renewable energy certificates, which represent the environmental attributes of the power produced from renewable energy projects. The U.S. Department of Energy’s Weatherization Assistance Program (WAP) enables low-income families to reduce their energy bills by making their homes more energy-efficient. Through this program, weatherization service providers install energy-efficiency measures in the homes of qualifying homeowners free of charge. The WAP program web site offers a state-by-state map of opportunities, projects and activities. The U.S. Department of Energy’s Wind Powering America site provides state-by-state information on wind projects and activities, including wind working groups, validated wind maps, anemometer loan programs, small wind guides, state-specific news, wind for schools, workshops and web casts.